The past few years have been tough for Milo Yiannopoulos, the writer(?) whose fascist, racist, Trumpy fanboyism has made him one of the most reliably hated people in the internet. Or at least he used to be on the internet, as he’s been kicked off Twitter, quit Breitbart before he could be fired, and lost a Daily Caller job, so you really have to try to find him online now—not that you’d want to. He also famously lost a book deal for making seemingly positive comments about underage boys having sexual relationships with older men, so that was fun. His latest unfortunate/schadenfreude-inducing setback is that he’s been banned from crowdfunding platform Patreon just about five minutes after setting up his campaign. Alright, it actually took about a day, but our friends at Splinter are reporting that Patreon still wasted no time in booting Yiannopoulos from its platform over his previous association with famously awful/stupid far-right group the Proud Boys. Patreon’s official line is just that Yiannopoulos was banned because the site doesn’t allow anyone with connections to “hate groups, so you probably could pin the ban on any number of people that Yiannopoulos chooses to associate with. 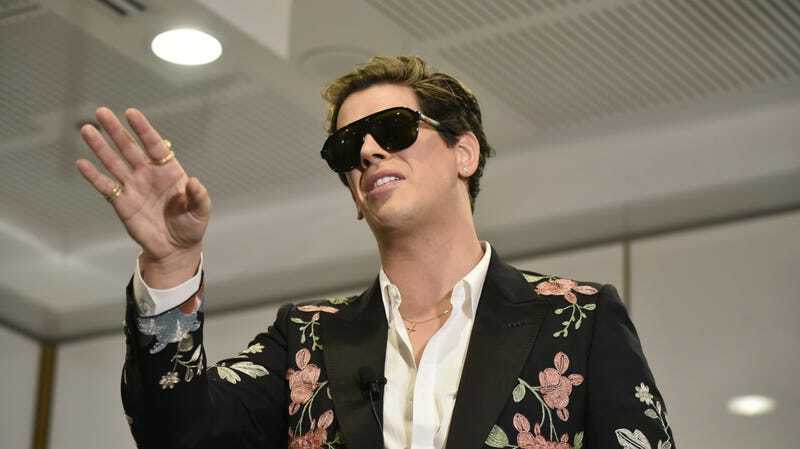 The Verge says that Yiannopoulos wanted to use the Patreon money to fund a “weekly late-night TV talk show,” but there’s also the fact that he’s reportedly several million dollars in debt due to all of those previously mentioned setbacks. Had Yiannopoulos’ Patreon stuck around, backers could’ve looked forward to hot rewards like “free Milo ringtones,” an “elite-tier” coffee mug, and the privelege of having Yiannopoulos fly to wherever you are and take you and a friend out to dinner once a year—a steal at $750. Sadly, Yiannopoulos will now have to find another way to swindle people out of their money.